There are about 790 islands off the coast of Scotland, of which about 130 are inhabited and only 62 exceed three square miles. The main groups are the Inner and Outer Hebrides, to the west of the mainland, and the Orkney and Shetland Islands to the north. Other groups of islands are located in the Firths of Clyde and Forth as well as the many sea lochs found along the west coast of Scotland. Hebrides is derived from the Norse word Harbredey, which roughly translates as the isles at the edge of the sea. The inner group includes Skye, which is the second largest of Scotland’s islands although, due to the bridge connecting it to the mainland, some no longer consider it to be an island. Skye is also surrounded by a number of smaller islands, including Raasay, Rona, Scalpay and Soay, while just to the south are Rum, Eigg, Canna and Muck, which are collectively known as the Small Isles. To the west of Skye are the Outer Hebrides, which are also known as Eilean Siar, the Western Isles. This chain of islands starts with Lewis and Harris that, despite being referred to as if they are individual islands are part of the same land mass. Lewis and Harris are also referred to as the Long Island and is the largest of Scotland’s islands. Continuing south, the island chain includes literally hundreds of smaller islands, including North and South Uist, with Benbecula in between, and Barra. These islands have many associations with Bonnie Prince Charlie, such as Eriskay off the southern coast of South Uist, where the prince first set foot on Scottish soil, and Benbecula, from where the prince sailed over the sea to Skye with Flora MacDonald, who in turn was born on South Uist. Heading south from Skye and the Small Isles, through the Sea of the Hebrides, the next islands encountered are Coll and Tiree, with latter being the furthest west of Inner Hebrides as well as being the sunniest and windiest place in Britain. To the east is Mull, the second largest island in the Inner Hebrides or largest if Skye is no longer considered to be an island. Off the west coast of Mull are a number of smaller islands, the largest of which is Ulva and Gometra, which like Lewis and Harris is one island that is considered to be two separate islands. Iona, which is associated with St. Columba and is also the burial place of many Scottish kings, sits off the south-west corner of Mull while Staffa, which is famous for its unusual rock formations and Fingalâ€™s Cave, sits to the south-west of Gometra. North-west of Mull, in the entrance to Loch Linnhe, is Lismore while to the east, Kerrera sits in the Firth of Lorn between Mull and Oban on the mainland. Heading south once more, Seil is another island that some no longer considered an island as it is connected to the mainland by a bridge. Seil along with Easdale and Luing to the west and south are known collectively as the Slate islands. Continuing south-west is Scarba and, separated by the Gulf of Corryvreckan, the larger island of Jura. To the west of Jura is the smaller island of Colonsay with its tidal neighbour Oronsay, while to the south-west is Islay, the third largest of the Inner Hebrides or the second largest depending on your opinion regarding Skyeâ€™s status. Finally within the Inner Hebrides, to the east of Islay and just off the Kintyre peninsula is Gigha. Crossing the Kintyre peninsula, that is referred to as the Mainland Island, leads into the Firth of Clyde. The largest island in the Firth is Arran, which is also the eighth largest of Scotlandâ€™s islands, including Skye. To the north-west of Arran is Bute, the second largest island in the Firth and one that, like its larger neighbour, lies on the Highland Boundary Fault. To the east of Bute are the two smaller Cumbrae islands while the very distinctive Ailsa Craig, home to one of the largest colonies of gannets in the world, sits to the south of Arran. The Firth of Forth has a number of small islands that while not as large as those in the Firth of Clyde have a rich and varied history. Inchcolm, which sits off the Fife coast near Aberdour, is known as the Iona of the East and has the remains of an abbey established by David I following a promise made by his older brother, Alexander I. Bass Rock, to the north-east of North Berwick, has the remains of a chapel that is built on the site of a 7th century cell. A fortress that also stood on the Rock was rebuilt as a prison for Covenanters in the 17th century and Jacobites in the 18th. The Isle of May is the largest of the Forth islands and was the location of the first permanently manned lighthouse in Britain. 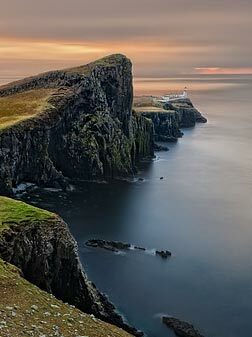 Many of the islands in the Forth are noted for their bird colonies, Bass Rock for example is home to around 80,000 gannets, and some of the islands have been designated nature reserves. Before heading to the northern islands it is worth mentioning that some of the inland lochs also have islands. Loch Lomond, to the north of the Clyde, has around 38 islands most of which are lined along the Highland Boundary Fault mentioned above. One of the islands on Loch Lomond is a crannog, a loch dwelling that was built for defensive purposes. Not all crannogs were artificial as the term is also used for islands used for settlement. Other lochs with islands include Loch Leven, near Kinross, where Mary, Queen of Scots, was imprisoned, Loch Tay, which includes a reconstructed crannog, and Loch Ness, which also happens to be a crannog. The northern islands of Scotland consist of two main groups, the Orkneys and the Shetlands. The Orkney Islands lie 6 miles north of the mainland from which they are separated by the Pentland Firth. Sitting between the mainland and the Orkneys is the uninhabited island Stroma. The group is made up of around 70 islands, with the largest island, known as Pomona or Mainland, surrounded by the other islands of the group. Mainland is joined to Burray and South Ronaldsay, the furthest south of the group, by the Churchill Barriers. These were built in the 1940s to protect Scapa Flow, which was used as a naval base during both World Wars. Hoy, the second largest of the islands, lies to the south of Mainland with Flotta sitting between Hoy and South Ronaldsay. Other islands in the group include Shapinsay, Stronsay, Rousay, Eday, Sanda, Westray, Papa Westray and North Ronaldsay, the last of which is the furthest north of the group. To the north-east of the Orkney Islands are the Shetland Islands, with the lone Fair Isle sitting roughly half way between the two groups. The Shetland group is made up of around 100 islands, of which about 30 are inhabited and, like the Orkneys, the largest is known as Mainland. The other larger islands, to the north of Mainland, are Yell, the Gateway to the Northern Isles, Fetlar, the Garden of Shetland, and Unst, the most northerly inhabited island of the British Isles. Smaller islands include Whalsay, to the east of Mainland, Foula, the most westerly of the group, Muckle Roe and Papa Stour, the great island of the priests.